Today was TEDxUBC in downtown Vancouver. Although I sorta knew what to expect, I’ve never been to a TED event before (though I’ve watched a lot of TED videos and have loaded the iPhone and iPad TED on my devices today) so I relished the opportunity and experience. I’m still, at heart, an academic. I love to think and ponder what is going on in the world, considering causes, effects, actions, and outcomes. So today’s TEDx event was focused on education, a topic near and dear to me because am, after all, and educator as well. Not only do I write books, but I teach as well. In fact, next Saturday (next week), I’ll be right back at UBC Robson Square to teach my Building Websites with WordPress class. Fitting then that I would be at my first TED experience, which focused on education, in the very place where I educate others. 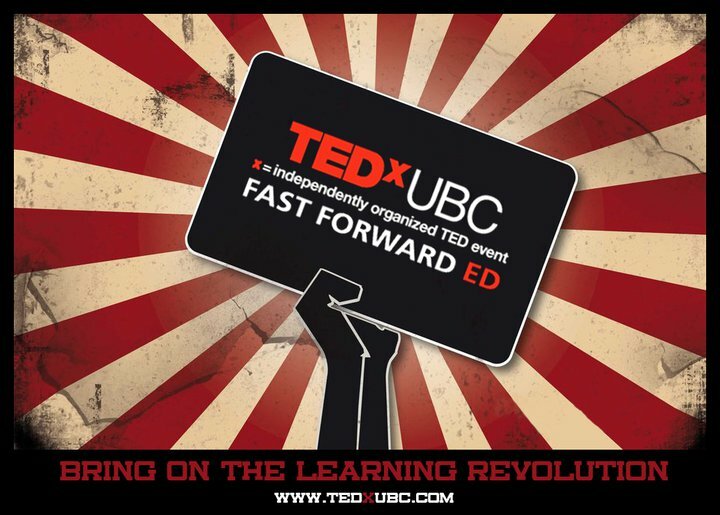 TEDxUBC was broken up into thirds: Fast Forward World, Fast Forward School, and Fast Forward Jobs. In each section I was challenged. In Fast Forward World, listening to teachers and students I wondered: am I teaching as well as I can? What can I do the very next week to engage, enthrall, inspire, and teach the 25+ people signed up for my class? These are people who are paying good money to learn how to build a website with WordPress. People taking a whole Saturday out of their busy lives to be locked in a computer room with me. I never come to class not wanting to do my best and not wanting to instill a sense of passion and and “yes, I can do this myself” in my students, but next week…well next week I feel like I need to go a step farther. Okay, finally in Fast Forward Jobs, well this at least I knew I had done something right. Last Spring I taught a class at BCIT call “Trendsetters”. It was a long-running class where the students were supposed to be exposed to the people who were doing the cool stuff, the cutting edge stuff, the outrageous stuff…and I know I succeeded. I know that how I challenged my students and the opportunities I gave them got several of them jobs or pointed them in the direction of things they wanted to strive for. Pity BCIT didn’t think so and hasn’t asked me back to challenge the students in this term. There was a lot of insinuation that things like grades, tests, learning history, reading literature, perhaps even science and math weren’t as important as giving kids more “real-world” experiences. By the end of the day, however, I think the truer sense was, that kids still need to learn those things, but we need to relate the information to them differently to meet how people need to work and live today. Remember your first “open book” exam or essay test that you could take home and work on with whatever resources you could put together? Remember how you felt that this was a better judge of what you knew and how to apply it? Isn’t it better to test how to apply ideas than to test if you memorized them perfectly? How often in the real work world are we thrown into a situation, expected to solve a problem and only given paper and pen and told that you can’t talk to anyone else? Yeah, I don’t think much “work” would get done that way. No, I’m not advocating that tests should be group projects. It is a truism than in groups there are often those who contribute more and those who contribute less. Maybe everyone does end up learning something, but in reality we do need to be measured on how we can individually understand and solve problems. Examples of work where management refuses to see the futility of using (or accepting) new technologies that could make work more efficient. Or at least the workers can stop hiding the fact they are using Google Docs to collaborate on a document with colleagues all over because MS Word isn’t the best tool in the shed for that task. I was struck by the irony of the teacher from Hawaii saying that mobile devices are the future for education, while at the same time parents are trying to get WiFi banned in schools. Where some parents in the CTV article I cited asked “why do kindergardeners need laptops” and in several talks teachers and students talked about kids coming into kindergarden with solid computer skills and advanced understandings of how to use them. So after a day of being challenged and inspired, I think we all owe it to ourselves and our kids to think about how we teach, how we learn, how we work, and how we want to society to be…and find ways to make it all happen. Oh, and just to make sure the whole technology connection to this site is clear to you…not once, not in a single talk did a teacher or student advocate for less technology in schools. They all advocated for accepting, embracing and applying some of the very technologies we use here (Facebook, YouTube, Twitter, Google) to be better teachers, students, and workers.